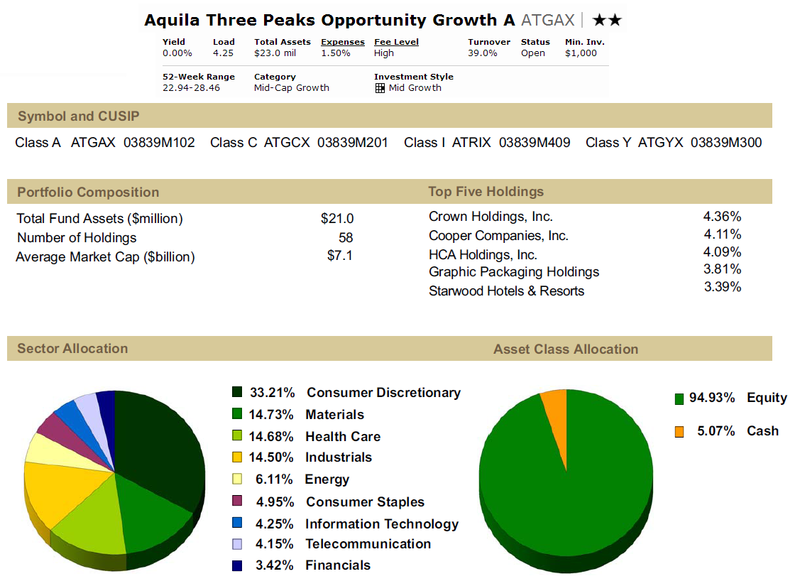 Being the top performer in the mid-cap growth category, this Aquila Three Peaks Opportunity Growth fund has slightly rather small total assets of only $22 million. It invests mainly in stocks of growing companies with any market capitalizations. Its annual expense ratio is 1.50% and the portfolio turnover rate is 39%. Brent R. Olson is the current fund manager. The year-to-date return is 22.76%. It has 2-stars rating from Morningstar. The best 1-year total return was achieved in 2003 with 40.47% and the worst was in 2008 with -41.07%. The fund has returned 16.32% over the past year and 5.88% over the past decade. The top 5 stock holdings as per September 2012 are Crown Holdings Inc (4.36%), Cooper Companies Inc (4.11%), HCA Holdings Inc (4.09%), Graphic Packaging Holdings (3.81%) and Starwood Hotels & Resorts (3.39%). The top sector allocation is Consumer Discretionary with 33.21%. 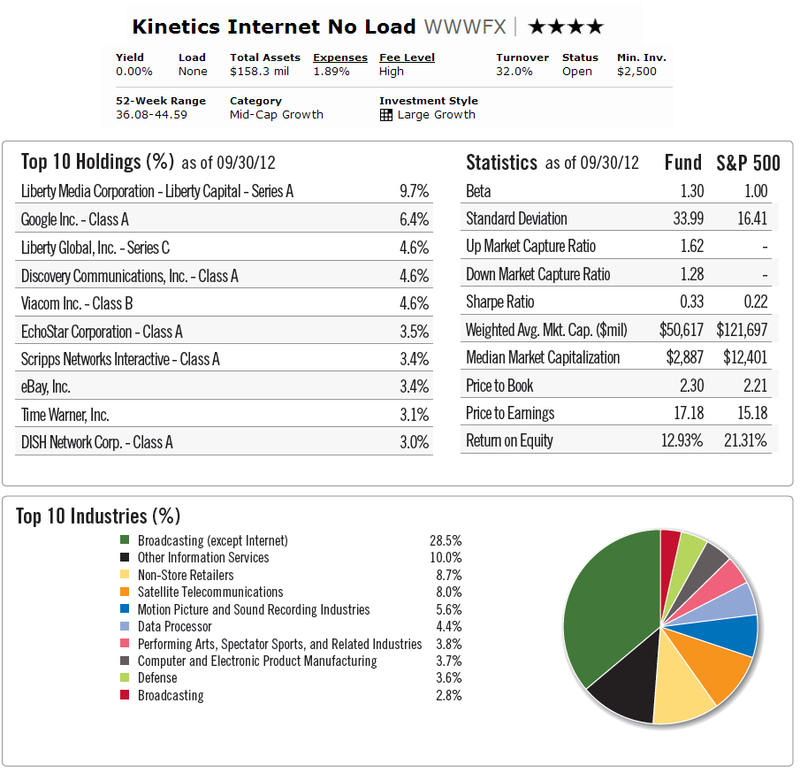 Kinetics Internet fund objective is to provide long term capital appreciation. It utilizes its assets to purchase common stocks, convertible securities, warrant, and other securities of U.S. and foreign companies engaged in the Internet and internet related activities. Peter Doyle has managed this fund since June 1999. Its total net assets are $154 million. The annual expense ratio is the highest in all the ten funds mentioned here (1.89%). The other classes are Class Advisor A (KINAX) and Advisor C (KINCX). Morningstar analysts rank this mid-cap growth fund with 4-stars rating. It has YTD return of 22.01% and 5-year annualized return of 4.38%. Based on the load adjusted returns, this best performing mid cap growth mutual fund has returned 14.51% over the past 3-year and 10.38% over the past 10-year. It has a 3-year beta risk of 1.30. 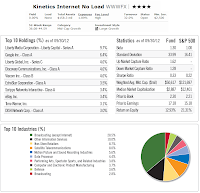 The top holdings of this Kinetics fund are Liberty Media Corporation (9.7%), Google Inc (6.4%), Liberty Global Inc (4.6%), Discovery Communications Inc (4.6%) and Viacom Inc (4.6%). The top industries are Broadcasting (except Internet) with 28.5% and Other Information Services (10.00%). This Davenport Equity Opportunities fund has just been introduced to public in December 2010. The fund manager is I. Lee Chapman, IV. Its total net assets are $76.44 million. This mutual fund focuses its investment in common stocks and shares of ETFs. The annual expense ratio is 1.10%. There is no management fee and no front-end sales load fee. This fund is currently available for purchase through DailyAccess Corporation (RTC and Matrix) only. 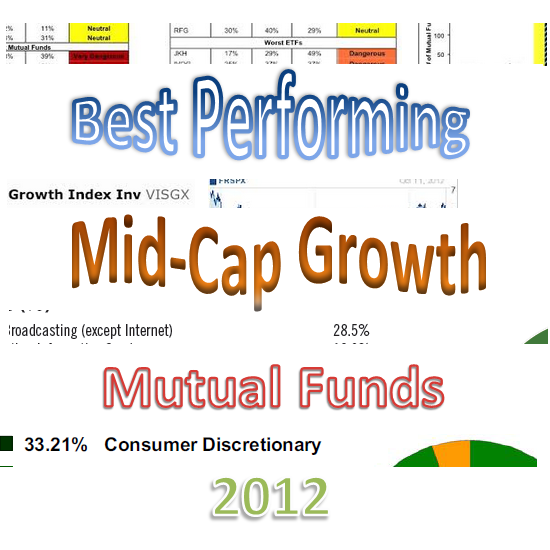 As part of top performer mid-cap growth mutual fund, it has YTD return of 21.64%. Last year (2011), the fund has recorded a return of 5.00%. There is no dividend yield currently. The top 5 stocks in its assets as of December 18, 2012 are Penn National Gaming Inc (6.23%), Carmax Inc (5.23%), Markel Corp (4.97%), Brookfield Asset Management (4.58%) and O’Reilly Automotive Inc (4.16%). 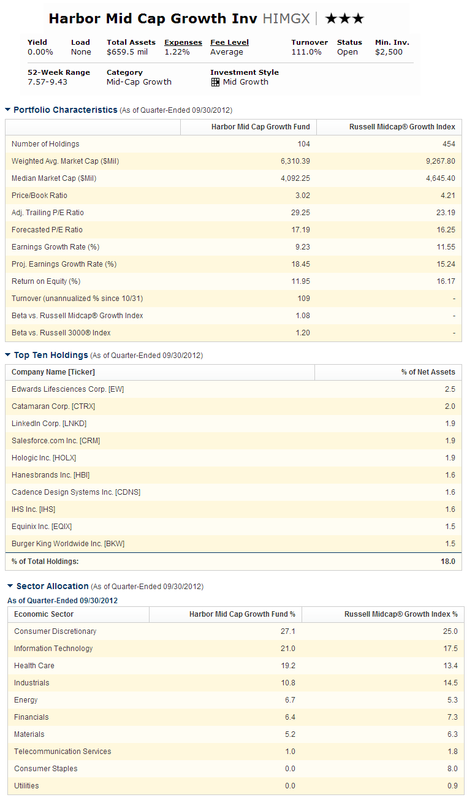 The PRIMECAP Odyssey Aggressive Growth fund aim is to seek long term growth. It has quite large amount of net assets with $1.59 billion. Its expense ratio is the lowest with 0.68%. Theo A. Kolokotrones has managed this stock fund since its inception in October 2004. The fund’s shares price is $19.17 (12/30/2012). Morningstar analysts have ranked this best mutual fund with the highest rating of Gold and 5-stars rating. The fund has returned 15.70% over the past 3-year and 6.29% over the past 5-year. It also has 20.85% YTD return. The best 1-year total return was in 2009 with 50.43%. The top 5 sectors as per September 2012 reports are Health Care (39.9%), Information Technology (28.5%), Industrials (7.7%), Consumer Discretionary (7.2%) and Energy (3.0%). Harbor Mid Cap Growth Fund invests majority of its assets in common and preferred stocks of mid cap companies. The total net assets of this fund are $643.25 million. The current lead manager is Stephen E. Mortimer. It also has annual expense ratio of 1.22%. The minimum initial investment for brokerage account is $2,500. 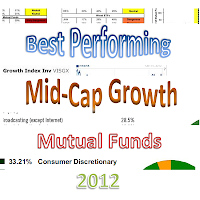 The fund benchmarks are Russell Midcap Growth Index and Russell 3000 Index. This domestic stock fund has 3-stars rating from Morningstar. It also has 20.54% of year-to-date return. Based on the load adjusted returns, the fund has returned 12.15% over the past 3-year and 8.81% over the past 10-year. The fund’s NAV is $8.93. The top 5 stocks in its portfolio are Edward Lifesciences Corp (2.5%), Catamaran Corp (2.0%), LinkedIn Corp (1.9%), Salesforce.com Inc (1.9%) and Hologic Inc (1.9%). The top sectors are Consumer Discretionary (27.1%) and Information Technology (21.0%).